Trains: Why run along the platform if you can walk through the carriages? Even at 3pm, there are a reasonable number of people heading home. It’s before the school and uni loads really hit — and remembering that there’s only 10 minutes between services on this line. Frequent all-day services help people who can be flexible with their travel avoid peak hours. And every person who does relieves the crowding for those who do have to travel in peak without being penalised by long waits. The trains (and their drivers) of course can do a round-trip — this train left the city at about 2:45pm — it’d be back in the city by about 5pm for a peak journey. Some train types are walk-through. This is a Siemens train made up of 2 x 3-car sets. You can walk through the 3-cars. X’trapolis trains are similar (but have end-of-carriage doors, and over-protective notices saying you shouldn’t do it when the train is moving). It astounds me to see people who have decided they must have a specific carriage running along the platform to reach it before the train departs, even when the train is lightly loaded. Why bother? Some might not know they can walk through, but the observant regular traveller should figure it out pretty quickly, shouldn’t they? Need help recognising the the different types of trains? Next → Next post: Aussie Sportball finals time! Why walk through a train when you can walk along the platform to your desired position and enter the carriage you want? @Roger, you’ve missed part of the premise, which is that there is no time to walk along the platform. I’ve re-worded slightly to make it more obvious. On Monday I saw two police officers, not PSOs or ticket inspectors, taking the details of a student who had walked between carriages on a Comeng Train while it was moving. Surely overkill, especially when ticket inspectors did the same thing only 5 minutes later. You can also walk through on Comeng trains. You’re just not allowed to *stay there* between cars. People who walk through carriages always seem to be trouble, troubled or both. On the contrary, if passengers don’t disperse along the platform (when they have the time to do so), this also increases loading times when the train does arrive and also leads to delays. Station design also plays a part, including shelter being limited to only a small section of the platform and only having a single entrance to the platform at busy stations. Back in the 1980s when I was in my teens, I took the wording of ‘for communication only’ to mean, you can somehow talk to the person in the next carriage. Perhaps wave hands or something. I also had taken the ‘not for travel’ to include physically walking through there. I guess that was done from the thinking of ‘as you where in there while the train is travelling’ or something like that. I had no idea back then that communication can infact include a person walking through that area. Having said that, I try and board the closest door to me at the time of when the train stops. The only time I may move to another door, is if I notice a scrum around my nearest door, and a clear door further along. I can run and enter before that scrum is finished with. I do agree that the platform has some advantages such as it is flat, and less cluttered than the inside of the carriage. I would almost never walk car-to-car in a Comeng train, as I do not feel confident while doing so. On my local Siemens trains however, I will often walk through when I am about to get off, especially to avoid an already built up scrum, or to be closer to the exit gate. Most of the time, such as at my local Narre Warren, I get enough warning of an approaching train that I shall walk along the platform to where I want to anyway before the train pulls up. NOTE: I said scRum not Scum. I don’t think not walking through the carriage doors when the train is moving is a rule. The authorised officers do it all the time – they move their way through the carriage to check tickets, meet at the door and then walk to the next one while the train is moving. On the outer end of the Belgrave line the space between carriages on Comengs are famous for people who stand there and smoke while the train is moving! Tranzit: Yes, I didn’t know what “communication” meant either. I felt the same way as you. Daniel: I did understand your blog on carriage walk throughs. 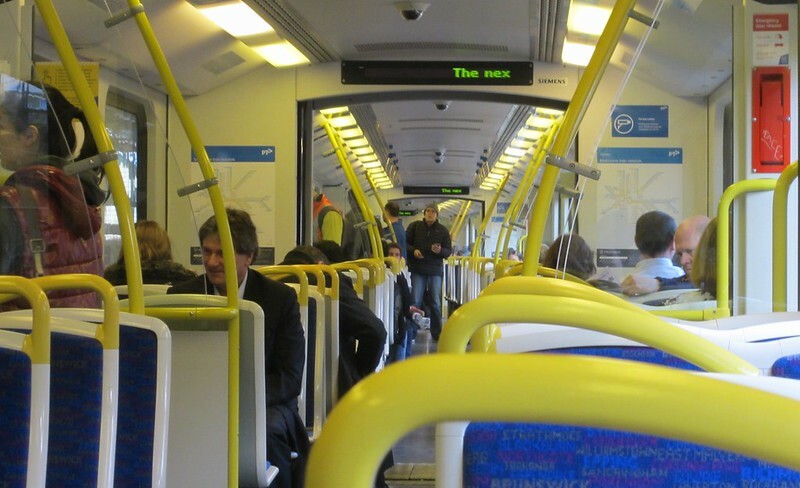 I msotly use the train during peaks where it is annoying/disruptive/dangerous for people to walk through carriages. (1) Not knowing until the train arrives how long it will be. ( this problem is not as relevant as it used to be ). ( how long = how many carriages, not how much time ). (2) Limited shelter on the platform. (4) Seeing someone you know on the train. (5) Wanting to get off the train at a particular end ( and not considering this factor in advance ).